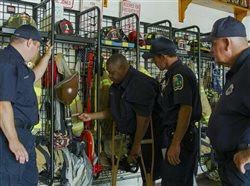 Eric Jones, of southern New Jersey, is not your typical volunteer firefighter. 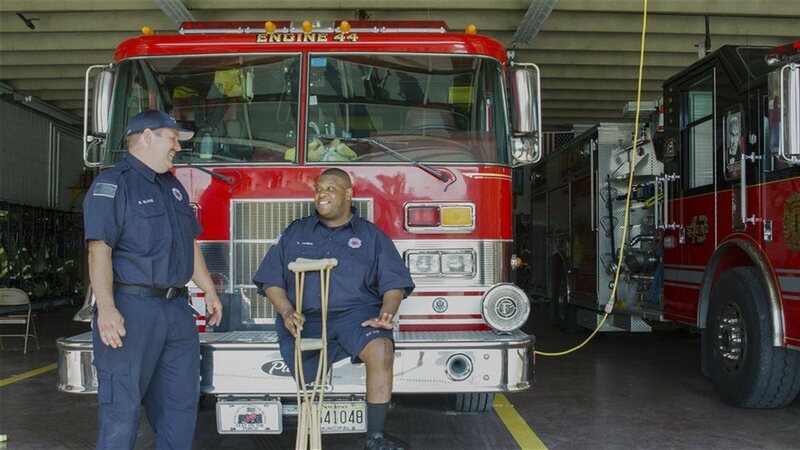 Jones, who works as a communications technician by day and a firefighter by night, has worked and fought fires with a prosthetic leg since the mid-1990s. 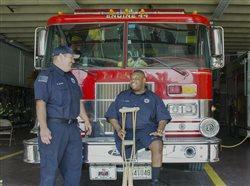 Eric was diagnosed with cancer when he was 11 years old and required the amputation of his right leg above the knee. Years of activity and injury began to deteriorate both his quality of life and the functionality of his left knee. Not unlike many people with knee pain, Jones’ issues started with an injury. “I tore my meniscus, then I had it scoped, and a few years went by. The pain started to get gradually worse and got to a point where I needed to do something,” said Jones, who began to change the way he went about his days to reduce the ongoing knee pain. Even with the physical and emotional pain he was experiencing, Jones was still hesitant to make the decision to have knee replacement surgery. Like Jones, many people dealing with knee pain find ways to change their lifestyle and daily activities to avoid consulting a doctor or considering replacement surgery. All that changed during one pivotal moment. For Jones, it was at that moment he knew he had to find something to make a difference in his life and talk to a doctor. This type of severe knee pain is most commonly due to osteoarthritis, a form of arthritis that is caused by a wear and tear of the joints1. It’s a progressive, degenerative condition that gets worse over time and impacts approximately 30 million U.S. adults1. Although knee replacement surgery is a common procedure performed more than 760,000 times each year in the U.S. alone2, there are always concerns for people about major surgery and for Jones this was no different. During their discussion, Jones and Dr. Post together decided that the ATTUNE® Knee would be the right choice for him. He had surgery for a knee replacement in early 2018. Jones worked hard at prescribed physical therapy and rehabilitation and then resumed work on his own at the gym to continue strengthening his knee. So far, he has had three follow-up visits with his surgeon and is doing well. It’s important to remember that the performance of knee replacements depends on age, weight, activity level and other factors. There are potential risks and recovery takes time. People with conditions limiting rehabilitation should not have these surgeries. Only an orthopaedic surgeon can determine if knee replacement is necessary based on an individual patient's condition.